OBAMACARE VISION – COULD IT BE TRUE? I saw the Election in November 2008 and I saw that McCain was running but he would not be elected, I also saw Hillary Clinton running for President. The End Result was that Obama was elected and that he won the Presidency and it was a Historical moment in time. I not only saw him win this election but he also won a second term in the future 2012. In this dream I watched Obama get on TV, it was in the future not 2008, I felt it was 2012. He went on all TV stations stating that his Obama care plan would be for all US Citizens across all 52 states in America. This would be mandatory and all US Citizens and Landed Immigrants would have to be under this Health Care plan. I watched as his speech continued, and he told the American People how much his Healthcare plan would be a great benefit to all the US and how he wanted to do away with all other Healthcare plans and make Obama’s Healthcare supreme over all other Healthcare. He told all the US people the Pros of having his Healthcare and how he would bring all existing Healthcare under his Obama care plan. He went on to say, those who refuse his healthcare would have the following things happen to them. First the IRS would audit all Citizens who didn’t comply. Second their credit cards and bank accounts would be frozen until the parties comply with the new Healthcare. If Americans still refused to come under the Obama Healthcare, they would be refused Medications or Medical help from all hospitals. If they still refused the Obama healthcare plan, then they would be made examples of and put in prison until they agreed to comply with his healthcare. If prison, the IRS, frozen credit cards, and frozen bank accounts still didn’t wake up the American Public, Obama’s final step of action was putting people in FEMA camps across the United States of America. Obama said that his Health care would eliminate all health cards and private information from being stolen and used by others. He stated that along with his Obama Healthcare that he would use a higher technology of using RFID chips to identify each person and to have all of their medical information stored on this chip. President Obama was so adamant over this being the best Healthcare Plan ever that he wanted all of this to be fully in place by 2013, no US Citizen’s or American residents would be exempt from this new Healthcare plan or the RFID chipping that was to follow it. I saw in this dream how this Healthcare plan was the beginning of the New World Order and the Mark of the Beast to enslave the people against their will. This was no longer a Free America but a Slave America under President Obama. He ended his Televised speech, the world was in total shock at the demands of the people to have this Healthcare plan of his, and the consequence of what would happen if the American people didn’t agree with it. End of Dream Personal note, I had this dream well before the November elections of 2008 and before I knew the full disclosure of the Obama Healthcare plan and the RFID chipping to do away with all medical cards and personal hard copy medical records. Coming Soon: Microchips In All Americans For Obamacare? Americans are apprehensive about a stipulation included in the Affordable Care Act which implies the future role of microchips in the world of health care. NBC aired a news special focusing on the new technology. “While the Affordable Care Act was making its way through Congress in 2009 and 2010, President Obama famously promised the American people over and over again that if you like your health plan, you can keep it. And so it goes. Caught in a trap made by the Illuminati banksters and their totally fraudulent system., A trap to destroy the middle class and bring in the MARK SYSTEM. The end game of all of this? A SINGLE PAYER SYSTEM, with no private insurance companies – you either enroll in GOVERNMENT HEALTH CARE, with all of its controls, including death panels, or you will be then a lawbreaker if you do not comply. It is very easy to see where all of this is going. The hearings being held are a farce. It makes one really wonder if the vision about Obamacare could actually be true, and come true before we know it! One more sign of the end? You decide. Comments and testimony of your feelings welcome. THE GOD FACTOR – HOW DOES IT WORK? Before we get to the GOD FACTOR part of this, I want to say how much your responses have been appreciated by many out there, that appear for the most part to be going through something that is odd for them, to say the least. BUT WHY? And why now? And why only in the last few weeks? I believe the GOD FACTOR is working to separate the wheat from the chaff, shaking all that can be shaken before the GREAT DAY. Something is coming, and coming rapidly now. He is at the door, wanting His Church to be refined, to be ready to leave, weaning off the last vestiges of our earthly loves, and TO NOT BE LOOKING BACK AS LOTS WIFE DID. Are you ready? Mary was frustrated because as she got into her car and was putting her seat belt on, she remembered that she had not picked up a return item that she had placed right by the door so she would not forget it. So she got back out of her car, angry at herself, unlocked the door, grabbed the item and got back into her car and drove away. Unknown to Mary was the fact that had she not forgot the return item; she would have been killed driving out of her driveway by a drunk driver. As it was, she noticed the police had pulled over someone not far from her home. So then why did she forget an item that she put by the door so she would not forget it? It is called the GOD FACTOR, who knew that if Mary drove out of her driveway at the specific moment she had planned on, she would now be dead – and the Lord wanted her to “live another day” as a James Bond movie title suggests. She was over ridden by a simple act of interfering and making Mary forget an item and making sure she would remember it again at the exact times needed to prevent her harm. Had Captain Cargill taken off at 7:22:11 PM instead of 7:22:45, we would have all read about a mid-air collision over Long Island at 7:41:44 PM , a collision that would have killed everyone on board on both aircraft, a total of 627 passengers and all crew members. As it was, a near miss report of only several hundred feet was filed with ATC. Was the delay part of the GOD FACTOR? Apparently, yes, because the Good Book tells us that the exact time of our death is known and APPOINTED before we are even born. No one on either aircraft was slated for their death that day, that hour, that minute or that second. They got to “live another day”. When I was a professional pilot, I had an incident exactly like that. We took off from Cleveland in what is known as a standard instrument departure also known as a SID back in those days. The weather was foggy and visibility only about ½ mile or so. As we were climbing out we had to make a right turn to pick up a certain heading in our climb out. We were just leaving 7,400 feet when the first officer shouted to me, “look out!” and as I looked up, I saw the wing of an aircraft slide right over the cockpit window. I could see the rivets in the wing as it went by. There was no time to react or do anything at all. Had we made any sharp maneuver, we would have hit the other aircraft as it was that close. It must have missed us by only a few feet at most and because we were in a climbing right turn, it missed the rudder fin as well, but just be a few inches. I said, “Call ATC and see if they have any traffic up here.” The answers was negative, no traffic, which I knew was not true, and that it was a CYA operation for ATC at that point. There was no panic, no nothing. We sat in silence as we proceeded in the flight. We all knew what could have happened but did not. So had we taken off just only one second earlier , maybe even a half second, I would not be here, and neither would the Lord’s research ministry. THE GOD FACTOR was in full operation. It has been all of my life, just as it has in yours. John and Grace Johnson and their three children left their driveway to go on a vacation trip at 7:45 AM for an early start. As they pulled out on State Highway 36 their car was totally demolished by an 18 wheeler traveling at over 65 MPH. The entire family was killed instantly. The driver of the loaded semi was beside himself, and he told officers that the husband, who was driving the car, looked right at him and the truck, as it was approaching the intersection of the highway and the driveway. “He looked right at me, I thought he had seen me, he stopped…” the trucker stated. But the family car simply pulled out right in front of him and he had no time to even react, let alone brake his truck or even swerve to avoid them. The GOD FACTOR must have been involved here, because the entire family was appointed to be killed at that exact moment in time. The GOD FACTOR must have blinded the eyes of the husband, and even though he looked at the approaching truck, he did not see it. He was blinded and saw nothing. The road was clear of all traffic and so he pulled out of the driveway only to be instantly killed. How many times have you personally looked left and right, and saw nothing, only to pull out and find someone whizzing by you? Where did they come from? There was nothing there when you looked – or was there? And how many times have these small insignificant things happened in your life as you look back? And how many times was a satanic plot to kill you thwarted by the GOD FACTOR at the very last instant of time? We might all want to reflect upon it. My daughter was driving on a rainy and foggy night on a twisting and turning road, and also going far too fast for the conditions. A deer popped up in front of her and she swerved to avoid it. The car left the road, became airborne and turned backwards and slammed into a large tree. The police were baffled because they could see the tire marks in the soft ground as she left the road, and then there were no more marks – but there was no reason at all for the car to become airborne or be turned around as it sailed through the air. It is a though angels had come, lifted the car up, turned it around and when it hit the tree, the trunk took all of the impact forces. Had she hit the tree head on, she would not be here, the police said. She would have been killed instantly. THE GOD FACTOR WAS AT WORK. And of course, the same GOD FACTOR is at work on nations and their leaders plans as well. Take Vice President Richard Chaney, for example. He wanted so badly to take out or punish Iran. He plotted and planned and each time, something would happen to totally frustrate the attack operation. It was not time yet. Later, possibly, but not then. It was not of the Lord’s time clock for those events. Everything at its appointed time. As I said before, no one can beat the time clock of the God Factor. No one. As a dear Christian sister has said a number of times “we are not in control”. Indeed, we only think we are, and in truth, we are to a DEGREE. You see, the GOD FACTOR already knows everything you are going to do with your free will. Because of total foreknowledge the Lord can then arrange things in your life to the benefit of HIS PLAN FOR YOU, not yours. Have you ever wondered why a certain person, for example, pops up in your life at a time when that person becomes of extreme importance to you? Maybe to help you through a time of trouble or to help you understand something you cannot quite grasp? Or is placed there for the love story of all love stories? Or to say something that triggers something in your mind? Perhaps a warm “hello, how are you today?” to a passing stranger that was thinking of suicide that very moment and you stopped it. Do we realize in truth, any of this as we wonder through each hour of each day? Do we realize at all what it might mean if we picked up our phone to call a friend at just the right time for the right choice to be made? Or to e-mail someone with a “how are you, miss you!” message. Do you know what the effect is? THE GOD FACTOR knows. We may all think we are in control but are we? Why do we suddenly do something that we were not thinking of doing? Or why does someone pop into our mind and we call them? Or why does our mind center on certain things at certain times, either for a good cry or a good laugh? So what are to take away from all of this? Don’t sweat ANYTHING, but take all things to the Lord and LET HIM handle that which we cannot possibly handle. Laugh at the delays, the mistakes, the insults we all get, and the apparent difficulties we all go through. There is a saying that I often use: “THE SHADOW KNOWS”. If someone asks me a question I really cannot answer, I will oft times answer “Only the Shadow knows”. It seems as if the GOD FACTOR does in fact operate in the shadows, unseen, often unrecognized for what He does or does not do depending upon some master plan out there we are totally ignorant of. But the fact is, if we will step back and watch the world and the events of the world, there IS a master plan for humanity, and we are given bits and pieces of it through prophecy. What is true for the world is ALSO TRUE FOR YOU – SO DON’T SWEAT IT, RELAX IN IT. So then, if all of this is true, and it appears it is, then why do we worry about all of this and all of that? Are we not told in the Bible not to worry, not to fret? Worry can become such a burden it chokes everything in one’s life. Worry is really disobedience to the Lord of Hosts. It means that we really do not trust Him as we ought. Apostasy bring punishment, and punishments can be so severe we would be shocked if it were shown to us. So the lesson in all of this appears to be THE LORD IS IN TOTAL CONTROL, even if we do not realize it or want to believe it. But what about the far less fortunate? What about the tired, the poor, the sick, the homeless? The Bible tells us that the LOVE OF MANY GROWS COLD as we near the time of the end, and the evil men and woman will wax worse and worse. But that does not prevent you and I from lending a hand, perhaps money, perhaps time or both, perhaps in clothing or food, now does it? Jesus said the poor and the sick would always be among us, that their deck of cards was stacked against them for reasons unknown to us. And it can happen to us as well at any time, for only the GOD FACTOR knows the future. So then, reach out and do what you can while you can, STOP YOUR WORRY, LET GOD HANDLE IT, because the NIGHT SOON COMETH WHEN NO MAN CAN WORK. After all, maybe it is a truth that only the Shadow knows. Not too long back I had a dream and I found myself walking up our hill in Vermont where I grew up as a young lad. It had snowed and there was about 4-5 inches of fresh light fluffy snow on the road as I walked up the last hill. I remember how vivid it was, and how the snow drifted around my feet with every step. I was going home to see my brothers and my mom and dad. I was full of hope as I turned onto the driveway that led to our house. As I approached the house, I noticed there were no lights on, and there appeared to be no activity at all. As I entered the house I found that no one was there. It was dark and silent. I looked around and called for them, but no one answered. I looked in each room, hoping against hope. There was no one there at all – they had all vanished somehow in the long corridors of time. My heart sank and I soon realized that the past was gone forever, and could never be recalled. No more Thanksgivings; no more Christmas, no more laughter, no more fights with my brothers, no more anything, for it had all vanished in the fog of times gone by. I awoke, feeling sad and sorry. But the message from the Lord was very clear – there is no going back, when you put your hand to the plow, you must stare straight ahead, you must NOT EVER LOOK BACK, you must set your face as flint, and continue on, not flinching. DO NOT LOOK BACK on what might have been or what was. It is gone now, and we must learn to say goodbye to it or it will bring us down. How do you think Jesus must have felt when He knew His time was up and He was to leave all His loved ones behind? Not only that, but He knew He was going to be CUT OFF from His Father whom He knew and loved with a love we cannot fathom? But then again…could I have one more peak, Lord? Just one more? And so we get out our pictures and we reminisce about this picture or that picture of the long misty past of yesteryear. Time is the great killer of all. No one escapes. Can I have one more peak, Lord? Just one? But what are memories? Are they just dreams now? Waking dreams? How is it that one small word, a smell, an object can trigger a cascade of memories like it was yesterday? So we dream but we call it reminiscing – an attempt to recapture something lost in the mists of our memory. “Can I be in your dream if I let you into mine?” asked Bob Dylan. It was a good question, really, one that has no answer at all. And then we began to rise above the Earth slowly at first, ever so slowly the curvature of the Earth came into view, and then half of the planet, and as we gained speed, all of it. It was such a beautiful sight to see, a blue dot in the darkness of space, with the stars shining brightly all around it. Soon the Earth was gone as we traveled faster and faster through space and then a tunnel formed and the next thing I saw was the beautiful sight of a great light ahead and many angels traveling to and fro in the course of their business. The City was beautiful, there are no words to describe it. It was all true, all of it. More real than life on Earth. Far more real. More real than any dreams I had ever had. A WAVE OF SADNESS SWEEPING THE TRUE PEOPLE OF GOD – WHY NOW? It seems from comments and my own experiences of late that many Christians are feeling a great wave of sadness and grief for no special reason – it appears to be a combination of a sort of depression, a sort of missing real and true fellowship, and a wave of disappointment that the world will not listen anymore to the truth of things. It involves a deep missing of people you dearly love when they are gone, even if only for a short time. It is not easily explained. It seems to be deeper and much more profound than usual. I went into this wave a few weeks back, and it is not like me to be so depressed like this, for normally I am just the opposite – and then I began to hear from others who are now feeling this same odd unexplainable sense of sadness and for no special reason – and now I suspect the reason is that somehow we all know this is almost over – we are all sensing something coming, unseen, but known deep in the spirit – and the hugs and the kisses of our loved ones, our Christian brothers and sisters, wives and husbands will be no more – and that the Holy Spirit is doing His final weaning process – getting us ready for what is soon to come upon us – and that means that it must be close at hand. Perhaps we need to reread the below blog one more time – THE GOD FACTOR. Have you ever had to leave someone you loved? Someone so dear to you that it broke your heart to say goodbye, and knowing it was the last time you would ever see them? Most of us have, and we can identify. It reminds me of a Willie Nelson hit called “Blue Eyes crying In The Rain” a love story gone bad. Is that what this is really all about? Is the Holy Spirit refining us, getting rid of all of those “earthly” things that we are hanging on to but don’t want to admit it, but He knows it? Or is it because we all know that soon all of us will be saying goodbye and also know that we may never see some of our loved ones ever again as the great separation takes place? Something is in the wind, and I would love to hear everyone’s comments concerning this – are you feeling this and what is your take on it? Please comment, people to need to hear from you from your heart one way or the other. The best laid plans of mice and men seem to run afoul for one reason or another by “unseen” or “unknowns” that tamper with those plans – and many times totally destroy the “blueprints” so carefully laid out. “We have thought of every contingency”, the planners will say – meaning of course that the plans included back-ups, alternatives, that the hand evidently held aces in case things did not go as planned. This includes war plans, where one single event often decides who wins and who does not. Most people do not view life as a card game, but they should, because it is. And in truth one in fact does have to know when to hold on, when not to, when to walk away and when to run. If you don’t, then life will deal you a whole group of spades, and none of them aces, if you get the drift. I was a professional pilot for many years, flying the latest jets as a Captain for most of those years. I was also a flight instructor and safety officer in a number of flight departments. Flying is a card game. You always held aces in your hands, because things can go wrong, and they can go wrong in a big hurry – and when they do, and when the last ace you held has been played, well, that is when the REAL GOD FACTOR KICKS IN. It kicks in big time because there is nowhere to walk away and nowhere to run. You are stuck in an aluminum cocoon that will not protect you if you a hit a rock mountain at 500 MPH. It is then that THE GOD FACTOR is steering the ship for you, and you are not in control (not that you ever really were). You are, at that point, usually a bug splat somewhere on planet Earth. There is one good thing about it however, you usually will make the evening TV news, that last shot at stardom, even if only for one night and even if for the worst of reasons. I found out, through years of investigating aircraft accidents that killed thousands of people, that there was usually a trail of wrong decisions and bad choices made either by the pilots, mechanics or the “bosses” of that company. Sometimes as much as 24-48 hours before the crash occurred. Earnest K. Gann wrote a book called “FATE IS THE HUNTER”, and that book proves beyond all doubt that there REALLY IS A GOD FACTOR. The Bible tells us that your birth, your domains and your death are regulated by God Himself. Do you know what that means? It means when your time is up, REALLY UP, that NOTHING you can do, or anyone else can do, will stop your demise. WE CALL IT FATE. I call it the GOD FACTOR. Consider then that Planet Earth is nothing but an aluminum cocoon traveling through space at a tremendous speed. Ultimately then, mankind has nowhere to walk away and nowhere to run. He is stuck. And mankind really is STUCK. The masses of the world let corrupt leaders play the card game for them. The elite, while they may think they know everything there is to know about their “end game”, do not. They have played their last ace. They think they have won, and won well. In point of fact they LOST, and they are about to run into the most solid of all rocks – THE GOD FACTOR, and we could also call it “Daniel’s 70th week”. If you forget the God Factor, or you did not include it in the cards you were given at birth and must play as you walk through life, then you will be amazed and stunned at some events that will come your way – because the Lord of all, the one who is the GREAT OVERSEER, actually can and often does interfere in one’s life walk, even if they don’t know it. The interference is not usually very obvious. It comes about by “circumstances”. We could say “by chance”. It can include people who “drift” into our lives, like two ships passing in the dark of night on a vast ocean we call “life”. It is these “events” in our lives that shape us, sometimes torment us, sometimes defeat us, and we fold up our cards and die at the table, totally defeated. “It is what it is” the saying goes, “get over it, live with it”. The Lord is oh so blunt sometimes, when He tells us to NEVER LOOK BACK, because what was, was, and it is not now. If we look back, we may become sad, overcome with grief and sorrow for we all like to feel sorry for ourselves. You cannot change any of what “was”. Regrets don’t change it. NOTHING CHANGES IT. There was a reason why the Lord told us not to look back. We are all guilty, so then, if that is a truth, it is what it is – so don’t dwell upon it, because you cannot change it. If you do not want to be totally defeated, and you want to be an OVERCOMER, then you must not only recognize the GOD FACTOR, you must play your cards in such a manner so that they are “pleasing” to the GOD FACTOR, that invisible force that is always there, always watching, always wanting you to succeed, and that silent, invisible FACTOR will often CLOSE DOORS TO YOU and OPEN OTHERS. That is when you have to know when to walk away or run from one endeavor or situation and move to the next. Or leave it all behind!! THE GOD FACTOR is the most important factor of all, and it is the ONE FACTOR most people in the world reject totally, especially the Illuminati boys and girls as they are busy baking their cake known as the New World Order. For example, the United States, the first bowling pin that must fall for the New World Order to succeed, is evidently not ready to go along with all of this – at least not yet. Tomorrow maybe, but not today. Try as the elite might, the Lord appears to be throwing rocks into the batter, and the cooks must constantly attempt to pull out all those rocks because anyone knows that a cake with stones in it is simply not edible or desired. When I was very young, I would take rotten vegies and sand and make a cake out of it – but no one wanted to eat it. I often wondered why not? ObamaCare may or may not be one of the rocks that the Lord threw into the batter. But it could be – and it slows down the plans, frustrates the cooks, who in the end, may of course have to make a new recipe – more flower, more eggs, more sugar, more this and more that. They might call it a “single payer system” or something along those lines. They get angry, as you can see by watching those crooks who are the cooks, mixing their batter on TV. They get frustrated, start pulling their hair out, their faces get red, the veins on their necks grow and thump with each heart beat – all because of the GOD FACTOR. You see, there is a TIME SCHEDULE for everything under the Sun. The MASTER BUILDER OF THE GAME also built in a time clock. Bobby Dylan made a remarkable remark in one of his songs when he said if you are “not busy being born, you are busy dying”, rephrased it would be “you don’t kill time, time kills you”. The CFR, the Bilderberg, the major players of the New World Order have forgotten there is a God Factor as they get ready to bake their cake. The batter is almost ready, the oven is on, and then they find another rock or more sand in the mix. They have forgotten that He not only has a TIME CLOCK, but it is a time clock that no one can beat – not even them. Nothing will happen until the Lord of all decides it will happen. And nothing will stop it once that time has arrived. It is usually stated in the Good Book as “a time appointed”. If anyone attempts to BEAT THE CLOCK, then the God Factor emerges from the shadows, throws rocks in the batter, making the cooks clean up their bowls, removing the bits of rock and sand – frustrating them time and again. It can become so frustrating that people give up, not realizing that the time was not then, not now, and might not ever be – as the HOPI said, you need to “go with the flow” and not worry about the delays, the obstacles in your path. You need to learn to laugh at them, go over them, learn from them, and MOVE ON and attempt to figure out the GOD FACTOR in your life. Why has He done this to me? Well, it could be for a number of reasons – maybe something was holding you back and you did not recognize it. Or it could be there are lessons to be learned – sometimes very hard ones at that. Your salvation is very important to the Lord, and He will bring whatever is necessary for you to WAKE UP AND SMELL THE GOD FACTOR. As the world speeds up, it is said, you need to slow down. As the world becomes increasingly confusing, you need to stop and smell the roses and consider the God Factor. You need to hold your aces, and not play them just now. You need to slow down, count your blessings, thank the God Factor and RELAX as the world and the elite attempts to make their batter and bake their cake. Will they ever get their cake baked, you might ask? Well, yes, in a way they will, WHEN THE GOD FACTOR CLOCK SAYS “NOW”, but what is that to you? They did not consider the God Factor or His time clock. If you did, then you are under His wing, so then, let them have the world. Let them bake their cake and eat it too, which they will. Rocks, stones, sand, poison and all. It will choke them to death because the GOD FACTOR is always there. Even when you think it isn’t. As the saying goes, you cannot have your cake and eat it too. But the elite, well, they will try. Think of the GOD FACTOR as the fat lady. Remember it ain’t over till she sings. Get ready, I hear her warming up. A stenographer staged a bizarre performance on the House floor near the end of the debt ceiling vote last night, ranting about Freemasons before she was quickly dragged away by security guards…. Have we gone so far in America that we call a TRUTHFUL AND VERY ACCURATE DENUNCIATION OF WHAT WASHINGTON IS that we use such terminology? Is the Holy Spirit CRAZED? Do you know what the word crazed means? It means to become MAD, to become INSANE. The word “Bizarre” means odd, strange, unexpected, out of the norm.” Well to an apostate world, I suppose all of this is – but what will they call the Lord when the destruction really begins? Anyone who knows the Lord also knows that this is EXACTLY how He operates!! Well, perhaps any mention of or by the TRUE GOD in Washington D.C. to the totally crazed “rulers” would be really bizarre and would appear to them to be CRAZED. Here is what she said, Bless her for her courage – another major sign from the Holy Spirit to America, just as Susan Boyle and Terry were – and it simply all goes by either unnoticed or called “Crazed” and “Bizarre”. The court scribe who went on a crazed rant about the Constitution, religion and Freemasons after Wednesday’s vote to reopen the government said God spent the shutdown urging her to speak her mind. Reidy, 48, was hauled from the chamber and taken to the hospitalby Capitol Police after delivering her bizarre diatribe from a microphone near the speaker’s chair. “He will not be mocked. He will not be mocked – don’t touch me – he will not be mocked,” Reidy shouted as stunned lawmakers tried to calm her and pull her away from the podium. “The greatest deception here is this is not one nation under God. It never was…the Constitution would not have been written by the Freemasons. They go against God,” Reidy said. Reidy, a married mom of two young daughters who makes $126,050 a year at her House steno gig, is a fan of several Christian-oriented groups, including the evangelical In Touch Ministries, led by TV preacher Charles Stanley, according to her Facebook profile. Reidy grew up on Long Island – where she registered to vote in 1991 as a member of the Liberal Party, records show. Her husband – a video company owner and former director of the far-right Great Commission Ministries International – defended his wife’s public outburst. “My wife is a sweet, level-headed wonderful woman of God,” he told Pergram. Everything she said was totally true – Masonry is MYSTERY, and MYSTERY runs BABYLON AMERICA. America has been mocking God for years and years, and what she said to our leaders and now America itself is simple: GOD WILL NOT BE MOCKED. HE WILL DESTROY THE UNITED STATES. America never really was under God, as our founders were, for the most part, Deists and Mystery members. If you read the books written by the Masons, you learn that America had a split personality – a golden cup of the Lord on one side, and Mystery working to destroy her on the other.Yes, it is true that the Lord USED AMERICA to spread the Gospel to the four corners of the Earth – but He also warned us who America a REALLY IS, and I hate to tell you, IT IS NOT CHRISTIAN, IT IS DEMONIC TO THE CORE. The Statue of Liberty is the goddess of America – given to us by MYSTERY!! Her destiny, they all said, was NOT to serve the TRUE GOD, but the GOD OF THIS WORLD and to usher in a NEW WORLD ORDER. Notice “NEW WORLD”. The last time I checked America was the leader of the NEW WORLD. A long time ago now, it seems, we published “Babylon Is Rising”, and attempted to warn people that the United States of Babylon was going to undergo a massive internal change from the Republic she had been to the Democracy she was when we published it, to the POLICE STATE that she is now with Lucifer at the helm as he rises up to full power as a dictator. It has all happened exactly as Bible prophecy foretold. Not only did the Church refuse our book, they labeled it a “heresy” and only a very few bookstores would carry it. As I have said before, if you will not face the truth then you have to suffer the consequences of it. We are. What is worse is that our children have been so brainwashed by media and our public “propaganda” school system that they have now created THE SONS AND DAUGHTERS OF TYRANNY. The sheriffs, the deputies, the police departments, and most Federal law enforcement are mostly Americans who were born here, but seem all too willing now to destroy their nation from the foundation on up – and have no clue either that they too have killed their own loved ones as well as themselves. Oh, it is a slow death, one blow at a time. One freedom at a time. One innocent killing at a time. And with no shame, but rather, when questioned, heap scorn and contempt upon anyone who would dare question them. But have you noticed how EAGER these American sons and daughters are to use brute force upon anyone at all that even slightly “disobeys” their commands? Did you pay any attention to the staged “Boston” event and the martial law enforcement by LOCAL law enforcement upon their own neighborhoods? And this attitude is growing by leaps and bounds. And in many cases, they do not hesitate to do it to their own immediate neighbors? As the Bible says, “the love of many grows cold.” Indeed it does and it is also growing rapidly now. As the Bible also implies, it is also neighbor against neighbor as well.What happened in Germany, Russia, China and elsewhere is now happening here. Then our leaders and law enforcement have become Stalin, Hitler, Pol Pot, Mao and all of “them”. They are no different, and they are just as evil. Do not masquerade as the “good guys” with the white hats, which is the height of hypocrisy! No. they are just as evil as they were. And remember that all of these worst of the worst evil leaders could have accomplished nothing unless they had others willing to ENFORCE the evil. So then the SONS AND DAUGHTERS OF AMERICA BECOME JUST AS EVIL. Do you see where all of this is going? And the sad REAL truth is, the government does not have to bring in foreign troops to police Americans, we have our own sons and daughters who are too willing to STOMP ON THE FACE OF ANY FELLOW AMERICAN WITH THEIR BLACK BOOTS!! There is a SPIRIT rising within the ranks of law enforcement. It is the spirit of TYRANNY. It is US against them. All too often now, law enforcement AND THE GOVERNMENTS themselves ARE the domestic enemy of the American people. They will not police themselves and rarely will discipline an out of control officer. But what law enforcement and our local, state and federal governments do not grasp, and according to Bible prophecy never will, is the sad truth of the IMPLOSION and DESTRUCTION of American society that also destroys them as well, as it has destroyed all civilizations throughout history. You can bully people only so far, and usually it is some small minor event that ignites an explosion of retribution. It is human nature. The veneer of civilization is very thin, and when it breaks, all hell breaks loose, and people go “visit” those that oppressed them. The New World Order is relying upon “weapons” to control the masses, no matter how brutal things become. However, the masses will accept only so much unjust and evil activity, and then the population figures out that it really has nothing to lose by destroying the oppressors. It has never been pleasant when that happens, according to historical records. It will be far worse this time. And then of course, because of rank apostasy from the Bible, law enforcement and governments always forget the ‘GOD FACTOR”, that is, the one who does finally ENFORCE “HIS AGENDA” as opposed to “THEIR AGENDA”. And when that happens, well, that’s the time when the oppressors finally figure out they made a very bad, bad judgment call. A shocking report prepared by the Ministry of Foreign Affairs (MFA) for the Federal Assembly (FA) is urging a new law be passed giving to all Russians traveling to the United States a “warning” that American police officers have entered upon an “unprecedented killing spree” that in the past decade has seen nearly 5,000 innocent civilians gunned down without benefit of either charges being filed, or being convicted of a crime. Two of the worst American cities for police abuse likely to be visited by Russian citizens, this report says, are Chicago, which was condemned by the United Nations for its practice of widespread police torture, and New York City whose government paid out over $1 billion between 2000-2010 in lawsuit claims related to police abuse, and last year, 2012, had to pay out another $131 million to settle civil rights and police abuse claims too. Grimly to be noted, this report continues, are that the statistics for the nearly 5,000 people killed by American police officers in the past decade, including 587 killed in 2012 alone, may not even be the true total of these deaths as a study of killings by police from 1999 to 2002 in the Central Florida region found that US national databases included only one-fourth of the number of persons killed by police as reported in the local news media. Down Syndrome patient Robert Ethan Saylor, 26, who was brutally straggled to death by 3 Maryland sheriff’s deputies on 12 January and whose last words were cries for his “mommy” to come help him. 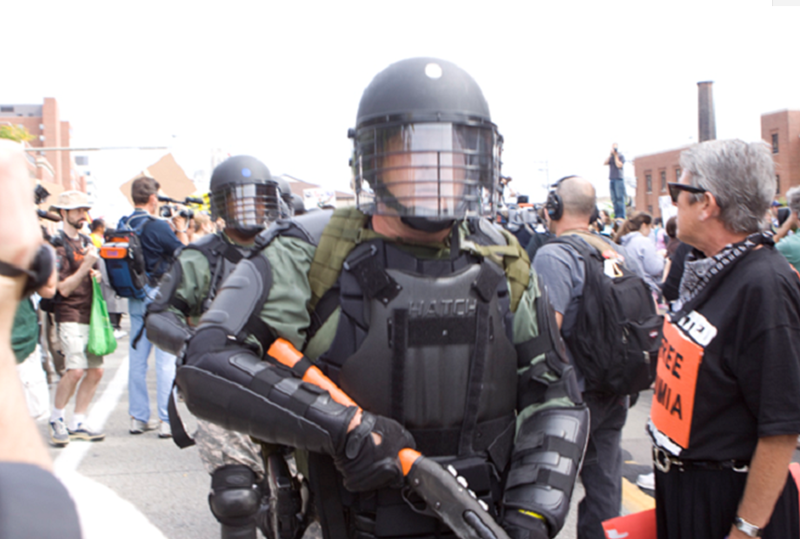 To the “kill first” mentality of American police officersthis report cites the 29 November 2012 public execution of Timothy Russell and Malissa Williams by Cleveland Ohio police officers, who for daring to flee from police after a traffic stop were chased by 104 police officers for 25-minutes and then gunned down in a hail of 137 bullets. Even though 63 of the 104 Cleveland police officers were suspended for the execution of Russell and Williams, this report says, no officers in the killing of Saylor or the shooting of Bennett have been charged. In fact, this report states, the lack of American authorities holding their police officers responsible for killing of innocents is virtually unheard of in the United States and has caused this unprecedented “explosion” of police violence. Allen Hicks, in 2012, who was arrested by Tampa Florida police officers for “not following orders” and was thrown into a jail cell where he was later found to be having a stroke, and which a few months later he died from in hospital. Elliott Williams, in 2011, who was arrested by Tulsa Oklahoma police officers on a minor charge and was left in his jail cell for 5 days until he died, all the while being neglected and his health ignored. What’s even worse, this MFA report warns, is that this unprecedented “killing spree” US police officers are now on is only going to get worse as these once honored guardians of the peace have become more militarized. And to whom these Obama regime leaders feel they are “at war” with, the MFA says, was recently revealed in US Court documents relating to a lawsuit against the Transportation Security Administration (TSA) which shockingly revealed that the invasive personal searches conducted by them upon their own citizens has nothing to do with preventing terrorism, but is, instead, designed to make these people as compliant to police authority as possible. October 18, 2013 © EU and US all rights reserved. Permission to use this report in its entirety is granted under the condition it is linked back to its original source at WhatDoesItMean.Com. Freebase content licensed under CC-BY and GFDL. Now, you can think what you want – but if I were you I would check the prophecies of the Bible to see where this is going, and why, I said at the very beginning, OUR OWN SONS AND DAUGHTERS are the ones who are murdering slowly THIS NATION by going along with all of this. With no enforcement ability, the worst of evil cannot be carried out. ONLY WHEN YOU FIND PEOPLE ALL TO WILLING TO CARRY OUT EVIL ORDERS from their superiors DO THEIR PLANS WORK. What we are watching, of course, is the rise of the FOURTH REICH called the NEW WORLD ORDER. The Luciferian’s plans worked so well in Germany, Russia, China, North Korea and elsewhere why change any of it? But why are our sons and daughters going along with it? Why are you, as a law enforcement officer, GOING ALONG WITH IT? You are going down. It may not appear that way now. It may appear you can continue your rank oppression and outright TREASON against your own people, but it will be punished with a punishment you never could have dreamed was possible. If you bow the knee to EVIL, then you are EVIL. If you will obey ANY orders that are do not fully protect the entire BILL OF RIGHTS, then you are part of the New World Order and you will wish you had never been born. So go home, take off your body armor, hug and kiss your wife and your children, and tell them you are sorry for bringing upon them not only their own slavery, but their death and eternal ruin because you could not see beyond your nose, and you could not see how brutal you have become.Now this is not to say there are not good law enforcement people out there, for there are. BUT IF THEY WILL NOT RISE UP AND CLEAN OUT THE VERMIN WITHIN, then they too must be branded as evil” by the Lord, and as part of the system of evil that is now upon us. DARPA NANOBOTS RELEASE A HOAX? 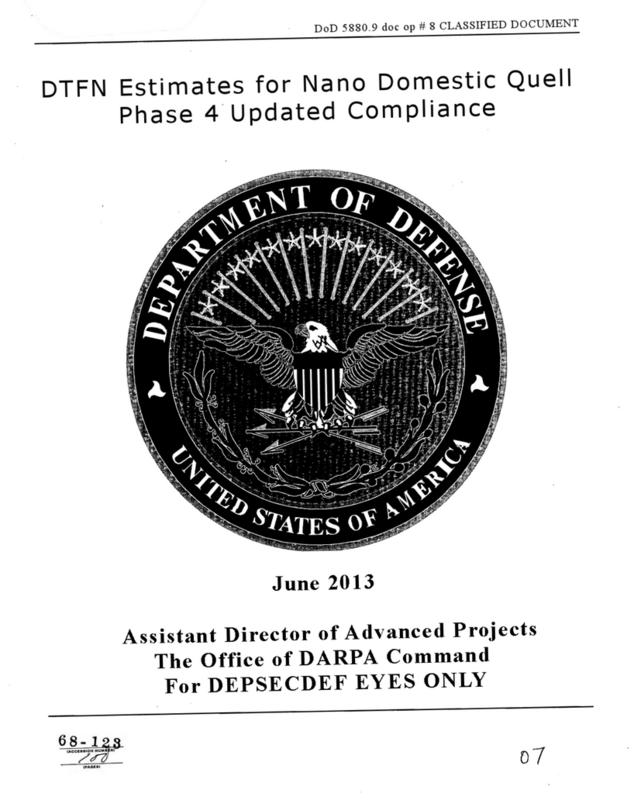 Evidently the so-called Defense Department document on nanobots is a “hoax”. As I said in the main article I posted, it could be easily disinformation or misinformation. But we have heard of the “nanobots” technology now for a long time, and although this document may well be hoax, the concept behind it IS NOT. The chemtrail operations have a much more sinister agenda in their operation than is being reported. When you combine together all of the items going on with the stated agenda of a mass culling of the human race (such as suggested in the Georgia Guide stones), and then you compare this with open papers by the elite concerning this “culling”, then you can bet that this “nano” technology will be used in one way or another in their operations. Many times we have run into so-called “fakes” that really are true – they are leaked, then debunked, when in fact they were true. This is how it works. Let’s say a scientific team finds giant bones – real big bones, say 45 feet tall – and pictures are taken of it. Because the NSA/CIA and other intel agencies are deep into the occult in one way or another, and HATE THE BIBLE, they themselves may leak one of the pictures actually taken of the “dig” and then they will have some university come forward and say it was all a fake, it was “photo-shopped” and debunk all of it. This process works very well and so it is used. When we did a documentary on the reality of the “Report From Iron Mountain”, it caused a big stir and a huge attempt was made to totally debunk it. I knew it was true for two simple reasons – it was all coming true, and secondly, Bible prophecy said it was true. The elite were scrambling to cover up the truthfulness of Iron Mountain. The so-called “Protocols” is always called a fake document, but is it? If it is such a fake, then why is everything in there being done? BECAUSE IT IS NOT A FAKE, ITS NOT A HOAX. IT IS VERY REAL. Same goes for “Silent Weapons For Quiet Wars”. It’s true because that is exactly what is happening. So while the documents may be a FAKE, the concept behind the documents is NOT. Insofar as being infected, I don’t doubt that because of all of the reports of people coming down with some form of “sickness” after being outside after a major chemtrail operation. It has happened right here. No one really knows the advanced operation going on in these “black operations”. I can tell you this, they are much further ahead than you could ever imagine. Bottom line, the only protection anyone has is to be UNDER THE BLOOD OF CHRIST IN TRUTH. The key words here is IN TRUTH. So in one sense it does not matter if the document is true or not – the elite’s attitude and their technology for these “nano particles” has been here for some time, and it would be very easy to first “infect” and then “trigger” a huge epidemic. We already know some of these so-called “epidemics” are caused by man-made viruses. These elite people will not stop until God Himself stops them. THE ZOMBIES ARE ALREADY HERE AND INSIDE THE BELTWAY – AND THEY WANT YOU DEAD!! When you point to the sky and tell your neighbor about “chemtrails”, he/she laughs at you, rolls their eyes, and says, “those are jet contrails”, what are you, some sort of conspiracy nutjob?” They turn away and run. And of course, if you do your research, you can find the United Nations reports, as well as British reports, on the dangers of “geo-engineering” and the consequences of being wrong about what it can actually do to our planet. And then of course, no one seems to notice that you cannot spray chemtrails over the nations of the world without some form of “official approval” from the leaders of those nations, and that means that someone in authority HIGHER THAN NATIONAL LEADERS has given the orders to do this. I think, by now, you know who that is, and if you do not, better get out the GOOD BOOK and study a little more to find out the WHO, WHAT AND WHY of those who rise up against the Lord and who destroy the Earth. Now those who have subscribed to the Global Report and Borderlands for the last 7-10 years already know all ABOUT CHEMTRAILS and the warnings I issued concerning them, and that there was a lot more to this than “geo-engineering” of the climate – a sort of “Terra forming” the Earth in a project called “Cloverleaf”. That was actually a cover for something else far more nefarious, like the “killing” of millions on Earth to comply with the equally nefarious GEORGIA GUIDE STONES roll back of the world population. It was to be done in two phases, I suspected, one to weaken the immune systems and the second to kill the population off. I don’t think too many people believed me at the time. I don’t think people understand that when the Bible says EVIL MEN WAX WORSE AND WORSE, that they do not comprehend what God is telling them, or the depth of evil involved. Something like Larry Taylor’s “Ultimate Evil”. This is something the rational mind cannot comprehend. I warned our listeners more than several years ago that it appeared to me that what was really going on was a TWO STAGE PROGRAM, one to weaken the immune systems of the masses of the world, and the second phase was the “KILL STAGE” that would literally murder BILLIONS of people, but no one could point a finger at the ELITE who did it, because people just happened to die from a strange “flu” virus, or whatever else these EVIL bastards could come up with. Like “zombies” that would kill each other and anyone else they could find. In other words, some “epidemic” would come along that no one knew how to stop it (Remember all the scientists who worked on these things were all mysteriously being killed – like 50 or more over the last few years?). Now when you hear on TV, which I did not long ago, that perhaps to SAVE THE PLANET, we would have to PUT INTO HIGH GEAR some type of “aerosol” product into the stratosphere that would make the skies turn “milky white” and that it was necessary for our survival, the bells went off in my conspiracy “nutjob” mind and I said “ah ha! It has begun.” I had the reports from the UN and Britain in my hot little hands that proved the “geo-engineering” was true right from the horse’s mouth – and I believe we have the other proof of a MAJOR EPIDEMIC found in the Georgia Guide stones that Mr. Christian paid for and put up, calling for a perpetual world population of only ½ BILLION. That means of course, the killing of now over 6 BILLION people. How do you do that and not get caught? How sweet, and ingenious, and how diabolical. Isn’t Satan such a wonderful entity? I offered opinions some time ago concerning the “zombie” CDC warnings, and actually began to appear in the other nations as well – along with movies, like “Zombie Apocalypse”. I wondered out loud about the possibility that perhaps the chemtrail mystery was becoming more clear – because why would a government agency like CDC ever use such a warning in the first place – unless we were all being given a clue – if you had ears to hear and eyes to see, that is. Of course there are other ways to kill off lots of good folks who refuse to bow the knee – like chemical or germ warfare, or many other ways, like war, etc. But none of them are as good as a “sure thing” “nanobot killing machine” that has no vaccine or ways to stop it. But is there any proof that this could be true? Or is this just another fake document of disinformation or misinformation? It depends upon how well you can play the game of “connect the dots” and further, once you have, you have come up with the “correct picture”. Sort of like the salvation puzzle of the Bible. The pieces are all there, all you have to do is connect them together correctly which millions do not, according to Matthew Chapter 7. Here is a possible confirmation of the “sum of all fears” that is so small you cannot see it, feel it, or know it is inside of you already – and then, when the trigger KILL SWITCH is pulled, you get a “flu” bug, and within 12 days, you are dead. And further, think of what this means if you could TARGET ONLY SELECTED AREAS of people, by race or “political or religious creed”, or folks who live in certain places? “As promised, these are some of the classified documents given to me by my good friend in the Department of Defense, a very highly ranked official I have known for many years. 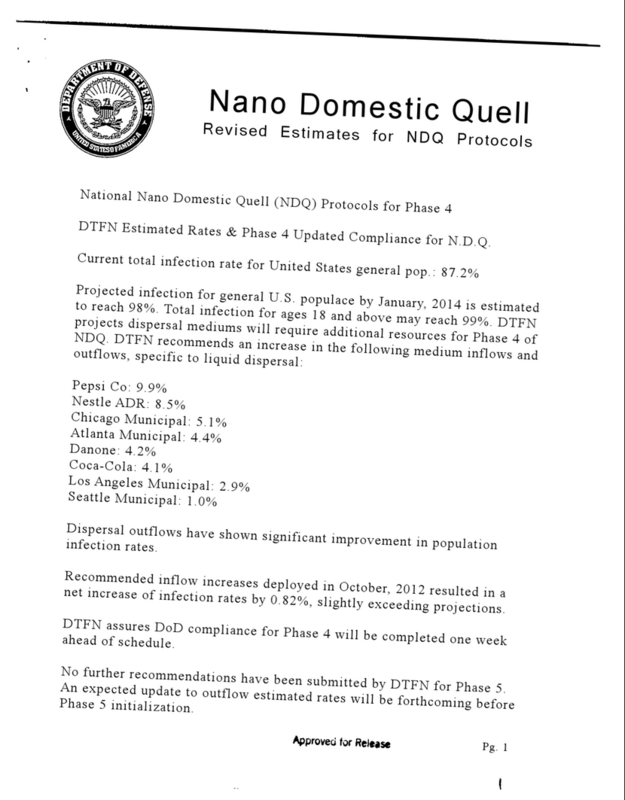 As the documents clearly demonstrate, the U.S. government has embarked on a program to implement a secret “Armageddon nano device” that mimics a flu virus, to be activated on the public in the instance of domestic uprisings, riots and armed resistances. The nano devices are in, or “carried” by, an estimated 87% of the population at this point, with a projected 98% inflected by 2014. Chances are, you already have this nano device inside of your body as you read this. Please understand: these nano devices are inert until activated by a radio signal or transmission. Once activated, the device will mimic the flu virus. You will be dead within 10 to 12 days. The military can target very specific locations, particularly with drones (why do you think they want drones over U.S. skies so desperately?). They can target a room, a small house, an apartment complex, a city block, a town, or a whole metropolitan area. By simply firing this signal, the nano devices in your body will be activated and you will die from what will appear to be a very severe case of the flu. The virus outbreak can scale from individual or group-targets, or to a large city-wide outbreak. This program was not created to kill everyone. Let me repeat: they are not trying to kill everyone. They created this program to deal with domestic uprisings during an economic collapse. It is now ready and being implemented. When the collapse happens, they won’t have enough troops to control the country or deal with the armed resistances. They needed another way of keeping control. By not having to fire a single shot to put down an armed uprising, they’re essentially “killing two birds with one stone”. A flu virus will appear to be a random “act of God” instead of perceived government aggression. Why do you think they haven’t banned guns? They don’t need to with this system in place. Please bear in mind that there is an active campaign underway to discredit me, attack me and bring me down. Please understand my children are sick and I believe their sickness — a bizarre skin condition that is worsening for both of them — is a result of my blowing the whistle. I believe they have been harmed intentionally. I believe they are trying to send me a message by messing with my children. I need your help. I need your trust. I need you to help this spread. I have more documents, with even more frightening information, but at this point, my life is in danger. If no one is paying attention or listening, it does me nothing to continue with this, other than put my life and the lives of my family in certain danger, all for nothing. If it doesn’t spread or go viral in some manner, we are finished, because they will continue to destroy me, remove any trace of me from the internet (records from my some of my previous employers are already missing, among other things), they will destroy me and the public will never find out about this. Please pray for us, pray for my wife, Helena, my son, Bill Jr., my daughters, Katherine and Grace. We need your help more than ever. And then you might say, this is ridiculous, you might say, as in the “Princess Bride” movie, “inconceivable”! But is it? When you couple all of this with the UN AGENDA 21 program, with their depopulated CORE RESERVES, INNER “BUFFER ZONES”, OUTER BUFFER ZONES, CORRIDORS, AND “RESTRICTED ZONES, and then “ALL USE ZONES” MOSTLY LARGE CITIES, well you might get the drift of where this is going. Not many people left in the now “rural” farming areas if you look at their “future” maps. And of course we must remember that the best laid plans of mice and men often come to naught because they forgot the “GOD FACTOR”. That is the biggest factor of all that the Illuminati minions seem to run into time and again. So I cannot tell you if this IS real, but I suspect it well could be, because, after all, the “chemtrails” were not real, we were told, along with the CFR, the Bilderberg, “Iron Mountain”, “Silent Weapons for Quiet Wars, and the Protocols”. Vaccines are NOT harmful, the NSA was NOT collecting data on everything we do, the IRS was NOT targeting “conservatives” and Snowden was a liar. Right? Have I left anything out? It might well be time to get under the wings of the MOST HIGH. Then it would not matter if you died or not. You might get real lucky – you might look up and see bright flash in the sky, and be no more, on Earth, that is. So the real question is, do you go UP, or do you go DOWN? Examine yourself, to see if you be in the FAITH. There is no other escape hatch. To refresh your memory the “bots” forecast a “global coastal event” that was going to change everything all over the world. As we have discussed before, it appears almost certain that the STAR SIGN of Revelation 12:1 is the MIDPOINT OF DANIEL’S 70TH WEEK. That means we MUST come this way and we arrive at April 11th, 2014 as the START DATE. 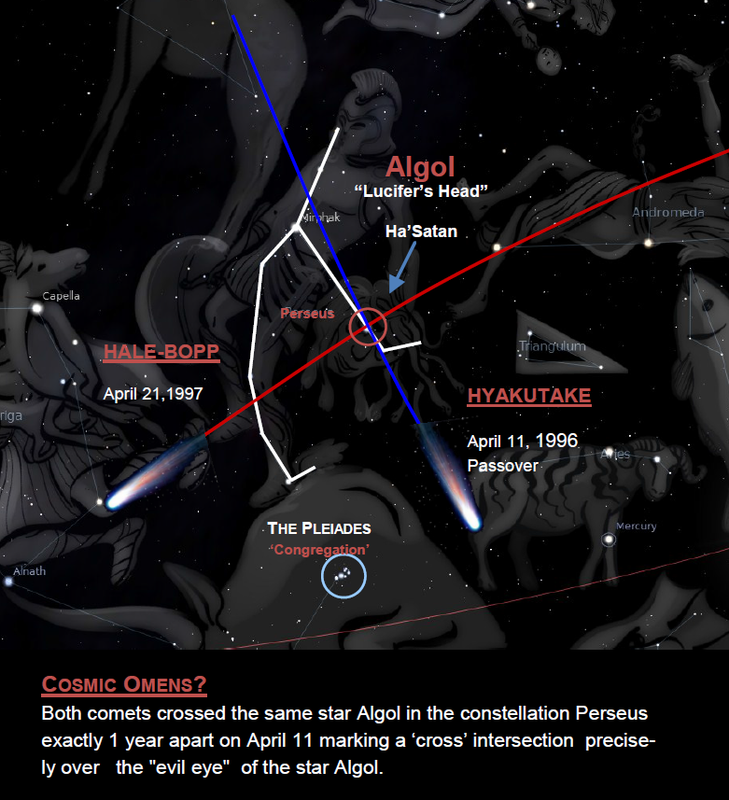 This is confirmed by the two comets, Hyakataki (1996), and Hale-Bopp (1997), that signed off Satan’s reign over the planet on a 4-11. It appears that Psalm 114 (4-11), is speaking about a DELIVERANCE OF GOD’S PEOPLE FROM EGYPT and the Earth is now “Egypt”. It also appears that some event causes a great “shaking” of the Earth, or “trembling”. This appears to be a WARNING EVENT, in other words, “shape up or ship out” type of statement to not only the Church but to the world at large. Up thrusting water will flood the coastal areas of the Pacific Ocean, as well as parts of the Atlantic Oceanby June 1, 2013. Again, our data, from the longer term set originating in 2003, has consistently held that a [plate rupture] will ‘participate’ in the global coastal event. It never has provided a ’cause’. The data would indeed support an extra terrestrial energy being the cause of the [plate rupture]. (Asteroid impact). In the Farsight.org study of 2013, both the Pacific and Atlantic oceans are participating in the occurrences that the remote viewers perceived overtaking humanity in this year (2013). From our longer term data set that originally appeared in 2003 under the label of [(oceans) sloshing (drawing back/moving forward/upward)], within our Terra entity (collection of data sets relating to planet/climate et al), has grown the total collection of data sets that have been labeled as the [global coastal event]. What had been puzzling were the repeated references to [ports dry], and [oceans withdrawing]. These sets grew in support along with others indicating exactly the opposite, that is, [ports underwater], and [lands (coastal regions) covered with water]. Of course, after the Band Ache earthquake and tsunami, the wording became a bit more clear, in that it is likely references to a momentary loss of water, prior to the [inundations] that were/are also part of the set. Further sets seem to confirm this view over time. Some of these included interesting descriptions of [fish swimming over the capital steps], and [jellyfish pulsing in offices]. produced the 2004 forecasts for [river in the atmosphere]. The sets have gained supporting sets for [mountains eroded (by the rains)], and other sets of similar vein. In these sets, the [rivers of rain] are described as producing [tens of inches (of rain) per hour] as a direct result of the [cause (whatever that may be)] of the global coastal event. There have been a number of sets in the supporting sets for the [flooding] that affects not only the coastal areas, but also most of the northern hemisphere of the planet, albeit not simultaneously. The data shows that [displacement rains (ocean water inland?)] will flood out major inland cities (especially those near rivers). Some of these floods will not be concurrent with the global coastal event, but rather result days and weeks later from rain and mud flows that alter the landscapes up river of them. Now we know from all of this that a major IMPACT EVENT would cause everything the bots have said – and a lot of other ripple effects as well. So what has this all got to do with Puerto Rico? Everything, if this prophecy is TRUE, and I strongly suspect that it is for a number of reasons. We have told you to watch what the “authorities” are doing, for they have many means at their disposal to know well ahead of time of a possible impact event, and keep it from the general public. And it does appear that Puerto Rico is a TARGET EVENT FOR A MAJOR IMPACT. That explains also the mad rush of PREPARATIONS FOR FEMA REGION III and also the shipment of supplies to Austin Texas, which FEMA believes would not be impacted by this event. I believe it to be absolutely true. He gives NO DATE but “SOON”. I’ll give you a synopsis of the prophecy and a link to it – it rings totally true to my spirit. to her hospital as well as thousands to other hospitals around the island. Mercedita Airport and dozens of Military Vehicles to the port. 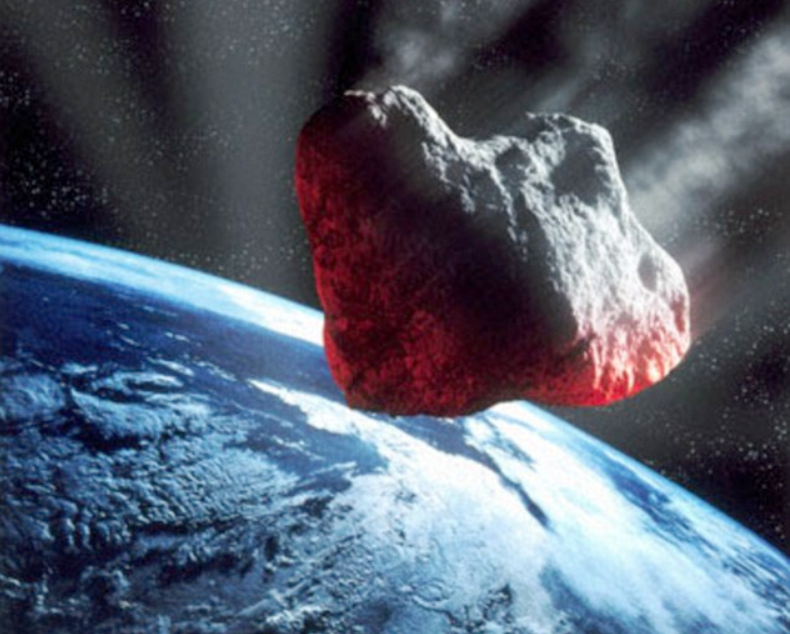 OK so there you have it – THEY KNOW THIS ASTEROID IS INBOUND, AND THEY KNOW THEY CANNOT STOP IT. Why are they preparing only for FEMA Region Three? FEMA’s Continuity of Government program! Florida would be wiped off the map in such an event because most of Florida is only feet above sea level – and the states just above Florida would likewise suffer severe tsunami damage, but they will be left on their own – the preps are for saving Washington and “continuity of government”. 1. 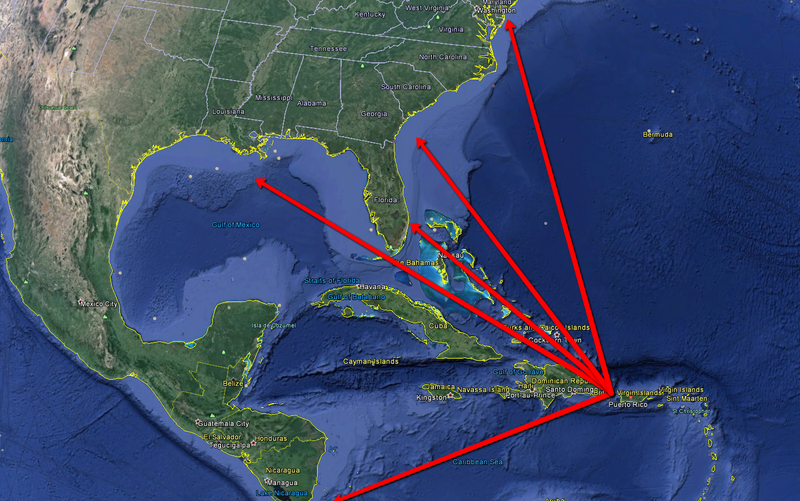 An asteroid will hit the island just west of Puerto Rico and the Atlantic ocean. He likens this to Noah ad the flood, as an event not expected whatsoever. 2. This asteroid will strike a key plate zone – remember the “bots” and the “plate quake”. That results in a 12 or 12+ mega quake. This might be the first domino that sets off a chain reaction of mega quakes for the East Coast, New Madrid and the Pacific coastal regions. There would also be major aftershocks, and such an impact event would make the Earth ring like a bell, possibly setting off volcanic and earthquake activity in Iceland the the Norway Sea as seen by Augusto Perez. 3. This mega quake results in a huge tsunami that radiates outwards towards South America, the Gulf of Mexico, outwards and eastward into the Atlantic and northward as it strikes Florida and all the east coast upwards. 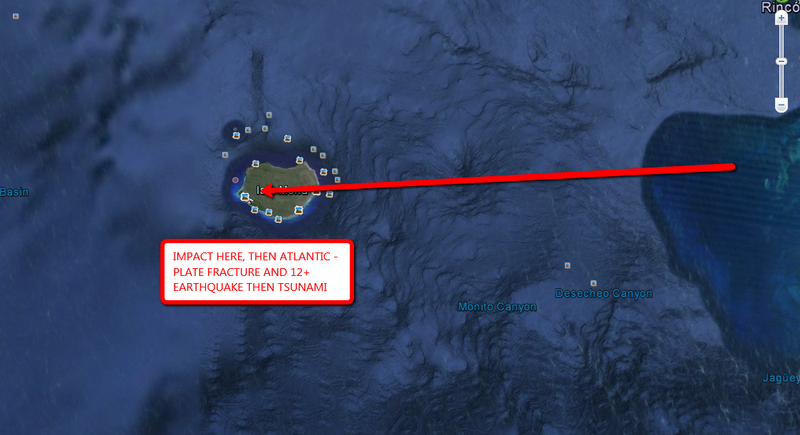 This tsunami will be traveling between 400-500 MPH. 4. The asteroid impact will be at NIGHT, and the tsunami will hit Florida at 5:00 AM he said, when most people would be sleeping.They would have no chance of survival. 5. This tsunami sweeps up the entire eastern seaboard, inundating many coastal cities. Now here is where the prophecy gets real interesting because of the Catholic prophecy of THREE DAYS OF DARKNESS. It appears to be centered over the America-Babylon. This is most likely a warning of the coming “hour of darkness” that destroys America in “one hour”. It would also tend to confirm that this might be the reason for the slowing of the Earth’s rotation and the “shortening” of the days spoken of by our Lord.Time will tell if this be true. 1. The strike is so powerful that it stops the rotation of Earth for three whole days – and as this strikes early in the morning, that means DARKNESS OVER AMERICA FOR THREE DAYS. Think about that one, and what that does to EARTH’S CLIMATE, WEATHER and how the oceans would wash up upon the lands all AROUND THE WORLD. Indeed it would be a “global ocean event”. 2. He claims that our government knows all about it but will not tell anyone for fear of massive panic. This is what Gordon Michael Scallion and James McCanney said as well, year ago, now. THEY WILL NOT TELL ANYONE OF ANY MAJOR IMPACT EVENTS. 3. He says that the USA will not come to help Puerto Rico for some time, probably because America will be preoccupied with their own coastal disasters. The “bots” indicate that this event causes a huge migration of survivors away from the coastal regions IN AMERICA. 4. Puerto Rico will get their aid from Argentina and further he says that Argentina was warned about it and is preparing for it. More indications that NASA and the CIA, along with the NSA know all about this incoming asteroid. It is interesting that this prophecy is partially confirmed, as we said, by Government activity in the regions that would affect continuity of government by a tsunami radiating from the Puerto Rico, and the states below FEMA Region III are “on their own” basically speaking. But what would be the other ramifications of such an event? 1. The ripple effects would be enormous, just as the “bots” said they would – but they did not touch on the possibility that such an event would cause huge “aftershocks”, the tsunami would radiate up the main rivers some distance, it could well set the stage for the New Madrid quake series, cause huge economic ripple effects, to say nothing of supplies from all coastal cities being shut down.Energy supplies, like oil and gasoline would be shut down. I remember another “bots” prediction of a major “event” that caused people to be burning parts of houses to stay war over a frigid winter – the type now being forecast for the northern part of the United States over the 2013-2014 winter. 2. If this tsunami were to radiate all the way to THE GREAT CITY BABYLON, NEW YORK CITY, the economic impacts on WALL STREET would be totally devastating, and would trigger a major series of global economic collapses around the planet. Is the prophecy true? After all, we had the prophecies of the San Francisco quake for October 3rd and nothing happened. But it will, of that I am certain, most likly sooner rather than later. So I suspect the vast majority of people will reject this as well – in spite of all the evidence that something is “in the wind” and the government knows all about it and has been preparing for it for some time, to be finished by October – November 2013. It all appears to come together.So we wait and we watch. This man states that he is a prophet of the Lord, anointed years ago, and after hearing him, I believe he well could be, for he says some key things I always listen for, and they are all there. He does not shy away from the HARD TRUTHS of the Lord, which is a key sign for the truth being told. And as to timing, he says that after a person he knew died (sounds like Noah), it would “soon” come to pass. That person died June 28th, 2013. What is this “shaking” of the HEAVENS and the EARTH? Sounds like a major event from the cosmos, does it not? Whatever it is, it appears close at hand – and that means you have little time to prepare yourselves if you have not already – and further if you have loved ones in Florida and along EITHER COASTS, warn them, and then their blood is not on your hands. We know that almost no one will listen to any of this. As the prophet said many, many people will perish from this event. That is most likely true as well.He also said he had been rejected by the Church, all except a few – I think I have heard of that before, somehow. Comments welcome – as always. It has always been amazing to me how when you post something about the possibility of a coming earthquake in California, you get thousands of people coming to visit. When you post something on TRUE salvation, SUCH AS THE “PARABLE” I posted yesterday, almost no one comes to visit and almost no one comments! Why is that? This has been true over the years and actually shows us why God is going to destroy the United States and the vast majority of Christians as well. Their priorities are so messed up that it seems that their only interest is THIS WORLD, and what is coming to THIS WORLD. While MANY are claiming to be of Christ they are actually ANTICHRIST in their spirits and attitudes. Most of the Christian sites put up lots of WORLD news – but not anything on true salvation, the key word being “true”. ITS ALL NEWS OF THIS WORLD, AND WHAT THIS WORLD IS DOING, and their salvation gospel is nothing but FAITH AND BELIEF, NOT ONE WORD ABOUT WHAT JESUS ACTUALLY SAID CONCERNING THE “WAY” OF SALVATION – and that means Jesus Christ was telling the entire truth when He said ONLY A FEW ever find the real truth, and the others may preach a good song and dance, they have no clue as to actual reality behind their existence. As we go deeper and deeper into the cold dark Satanic night, perhaps a few will wake up – but now I understand why the truth is so hated even by so-called Christians. These folks actually hate the TRUE GOD with a passion and don’t even know it!! America has chosen DEATH. The people of America have already sold their children into satanic slavery along with themselves even if they do not know it and they have no clue what is really going on all around them – but then again neither do the rich men and their minions, who are all dupes in a major scam run from higher intelligences – the princes and powers of the ether realms – and thus when Jesus said “They know not what they do”, he meant every word, THEY DID NOT, STILL DON’T and unless they repent now, or put their heads on the block for termination, they never will. That song was all about BABYLON AMERICA and its termination. Few noticed. Maybe some people out there will take notice – but then again, maybe they won’t, until they all get to THIS IS THE DAY THAT WE DIE. It’s coming real soon.